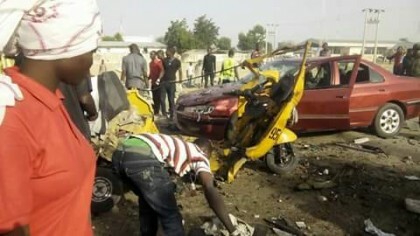 Nine (9)persons lost their lives with twenty-four (24) persons injured and evacuated to various Hospitals from the two scene of the explosion in Maiduguri, in the early hours of Saturday. The the first incident of the explosion occurred at the entrance to Bakassi IDPs and the second at NNPC station along Damboa road in Maiduguri. 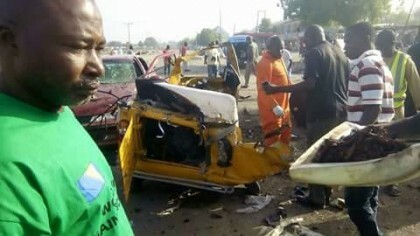 The Nigerian Army and NEMA officials confirmed the deaths the nine persons in the twin blasts. Col. Mustapha Anka, the Deputy Director, Army Public Relations Department, stated this in Maiduguri. ” At about 7.05 a.m. this morning, there were twin simultaneous suicide bomb explosions at the entrance of Bakassi Internally Displaced Persons (IDPs) camp and NNPC Mega Filling Station, Damboa Road, Maiduguri. According to him, the suicide bomber exploded killing the three occupants of the tricycle with no report of injuries. He said that the Acting General Officer Commanding (GOC), Brig.-Gen. Victor Ezugwu had already visited the scene to get first class information. “While we commiserate with the families of the late victims of this cruel act and wish those who were injured speedy recovery, we would like to assure the public that efforts are ongoing to track those behind the dastardly acts. Meanwhile, the National Emergency Management Agency (NEMA), in a statement, has also confirmed the killing of nine persons in the blasts. NEMA spokesman Sani Datti said nine persons were killed and 24 persons injured and evacuated to various hospitals from the explosion scenes in Maiduguri.